In 5th grade all I wanted was a pair of Guess jeans. I saved and saved and after months of saving I finally had enough money to bike to Macy’s and buy a pair. When I arrived, I realized that I couldn’t bring myself to use all of my money on just that one pair of jeans and a love of great value in shopping was born. In early high school I discovered vintage stores in San Francisco and Berkeley, as you can imagine, everything changed. Personal style is not about how much you spend or wearing the latest trends, it’s about feeling like your clothes represent who you are. I often ask clients to name three words they’d like a stranger to use when describing the client’s personal style. Body shape, three key words: those are the filters that drive every style decision from that point on. I do, however, work hard to help clients understand what is current and in the words of the Citizen, “wearing vintage clothes doesn’t mean you need to be in a time warp.” Pairing current with vintage is the way to go. I’ve included photos of a few pieces to help tell the story. 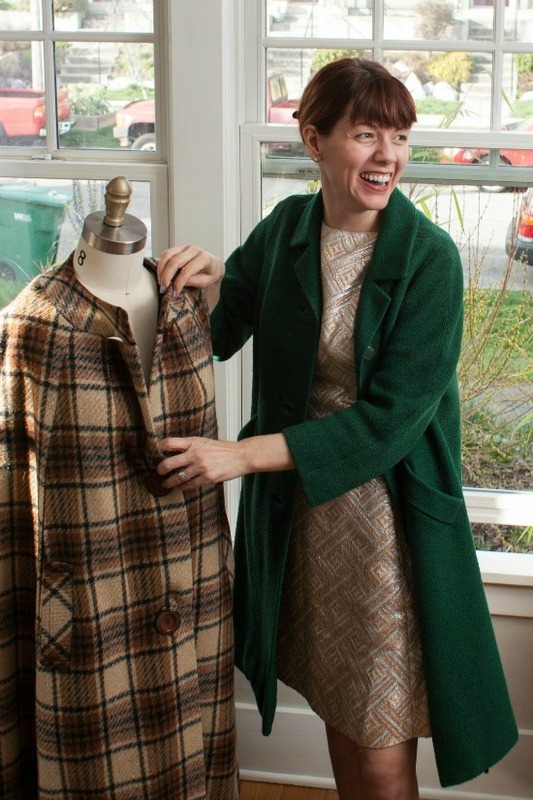 The first piece is a favorite of mine, a dark green vintage coat that I purchased used over 20 years ago and still wear often. Classic, bold, flattering and functional. It truly is timeless- playing nicely with a wide array of trends. I'm also wearing my go-to vintage dress in that photo. A find from Red Light in Capital Hill about 10 years ago, I've worn it to dozens of events. Any friend of mine knows it and that's saying something. The cut is great for my body shape and it has crazy functional pockets. Yes! As trends change I style it differently and it never lets me down. The beauty of a great vintage find is that it is memorable and communicates that you are more interested in the right dress than the right label. "The beauty of a great vintage find is that it is memorable and communicates that you are more interested in the right dress than the right label." Vintage inspired, used, new, it doesn’t really matter. When you know who you are, you simply mix, match and go. 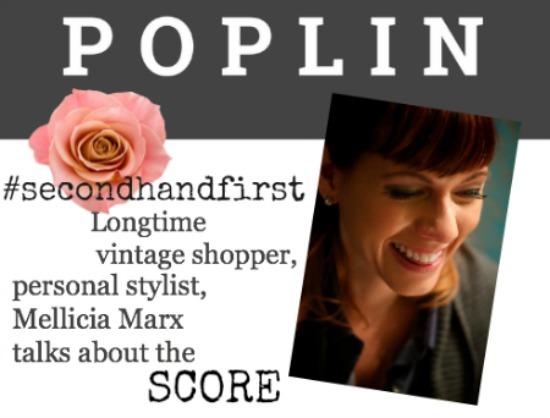 Mellicia Marx is founder and creative director of Poplin, provider of personal styling for men, women and kids. With a focus on the individual, Poplin assists clients in crafting a wardrobe that truly reflects of their own, personal style. Join us for the #SECONDHANDFIRST monthly link-up. 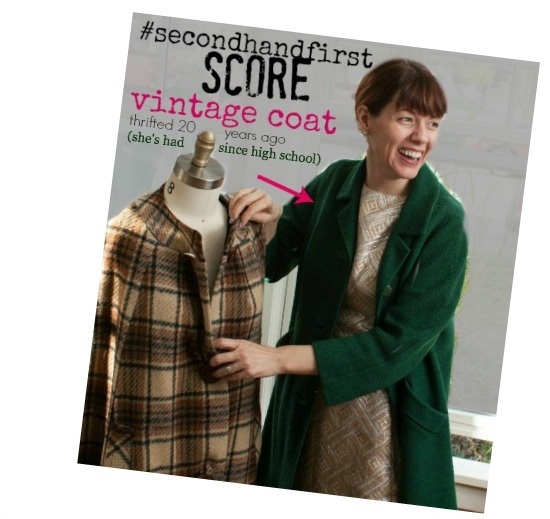 Come back and share your #SECONDHANDFIRST scores with us, Friday, March 28th. Super stylish lady!!! She looks fab in the cape from you! So fabulous! I love her look. I keep trying capes and they just don't work for me. Just letting you know I did hear from Meghan via email (I'm a dinosaur, that's all I do) a couple of weeks ago. Haven't heard anything since, though. I'll be back tomorrow night! I have some thrift, consignment and ethically-made items to join you link-up! 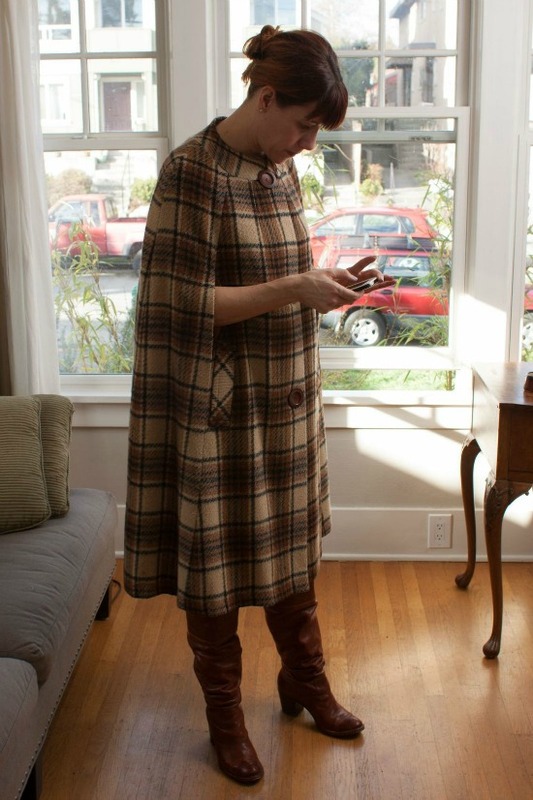 Cool coat, and cool cape, too! Inspiring style - I really need to think more long-term when I buy things. Yup, OK I'll take all three thanks! What an amazing selection of three favourite pieces!! Mellicia has very cool, uncluttered style - these are three great pieces that I would be happy to own. That is a beautiful cape and the colours look amazing with her hair. Oh, she looks so cute in that cape! I too have vintage that I bought 20 years ago that I still wear. Which is a testament to its physical longevity, as well as its style staying power. Because really, will crap people buy at Walmart or Ross last for 40 years? Not likely. But my wool coat from the 50s has lasted all the way up to 2014, and will probably last another few decades! How interesting - is that Seattle out her window? I am fully agree with it. Eventhough I am not buying vintage (not so often) but I am making garments for longer period - I prefer to buy things with high quality even if I have to pay more. Maybe it has to do with my past - I did not have enough money and it was not so many things to buy - I respect what I get and enjoy. Words of wisdom! Shop second hand is the best way to discover one's style!